Local pumpkins are now prolific at farmer’s markets and my Whole Foods. They are tasty, vitamin-packed treasures that are as versatile as you care to make them. Add in some of the last of my backyard chilies and yellow cherry tomatoes, and you’ve got a dish that’s downright good for you. Tonight I yearned for some Indian food and so I spiced up a leftover half of roasted pumpkin to accompany the fish I baked. With the new addition of mustard oil to my pantry and now this dish, I even felt like I might be breaking some sort of law. And after dinner there was a very distinctive warmth (not spicy heat) in my mouth that couldn’t be attributed to anything but that mustard oil. Who says cooking is boring? Sometimes it’s nice to have a sandwich for dinner. There’s a feeling of simplicity to it. There’s an even greater feeling of ease to if, if you’re using leftovers to start. I had some of the white ginger chicken leftover that was already deliciously flavored. Why not work that into an Indian spiced chicken salad, make a few fries and call it a night? I made homemade naan and fries, but you certainly don’t have to if you don’t feel you have the time (because secretly you do, it’s just how you choose to spend your time). 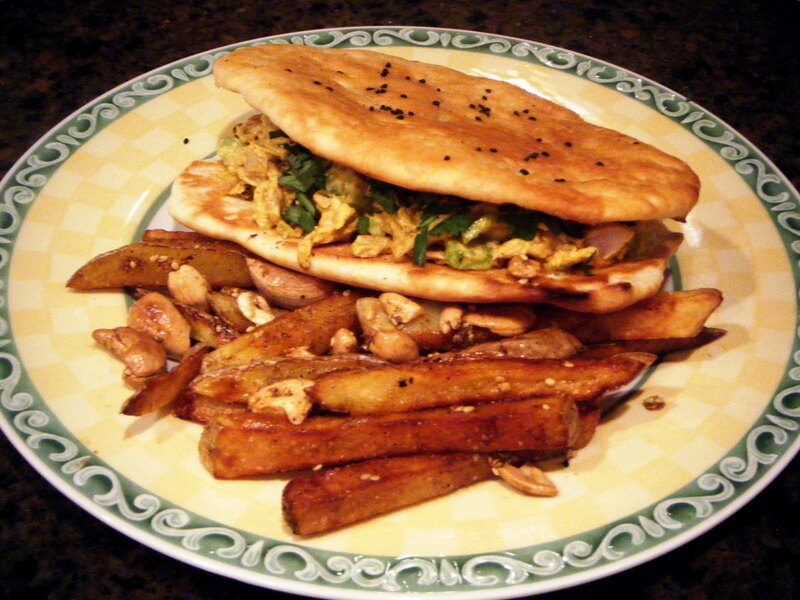 If you’re starting out at cooking, just make the chicken salad, buy the naan and spice some frozen fries with turmeric and sesame seeds and cashews. In a small pan, add the butter and onion and season with a bit of salt and a few twists of pepper. Cook over medium low heat until very soft and caramel brown. Drain onions from the butter, keeping both separate. In a bowl, combine chicken through mayo or yogurt and season with salt and pepper to taste. Chill. Combine all and knead for 10 minutes (a mixer with a dough hook works wonders here). Let rest for 15. Divide dough and shape into six small tear drop shaped pancakes. Sprinkle and press a few seeds into each. Bake on a preheated cookie sheet at 450 degrees for three to four minutes or until golden and bubbly. Brush with the onion butter. If using store bought naan, warm the naan then brush with the butter. I think this is what makes the sandwich great, don’t skip this step. Assemble the sandwiches and top each with some chopped cilantro or parsley (if you hate cilantro, and I know you haters are out there). Serve with Guajarati Potatoes or toss cooked store bought frozen fries with 1 T oil that has fried a bit of ground tumeric, chili powder some sesame seeds and a small handful of cashew nuts. Playlist included Young Blood by The Naked and Famous. Just because it’s a weeknight meal and it’s cold, and – let’s face it – you’re a little bit miserable, doesn’t mean that you have to compromise. We always hear the world is getting smaller. Things that we once thought were inaccessible, foreign and exotic, even five years ago, are now within easy reach of the home chef of today. As South Asian food and culture continues to entice new followers, why not adopt these beautiful, time-tested and spice-kissed flavors as your own, even if just for one night? You might just fall in love with the fragrances and techniques and make them a part of your cooking repertoire and perhaps, your family’s traditions. 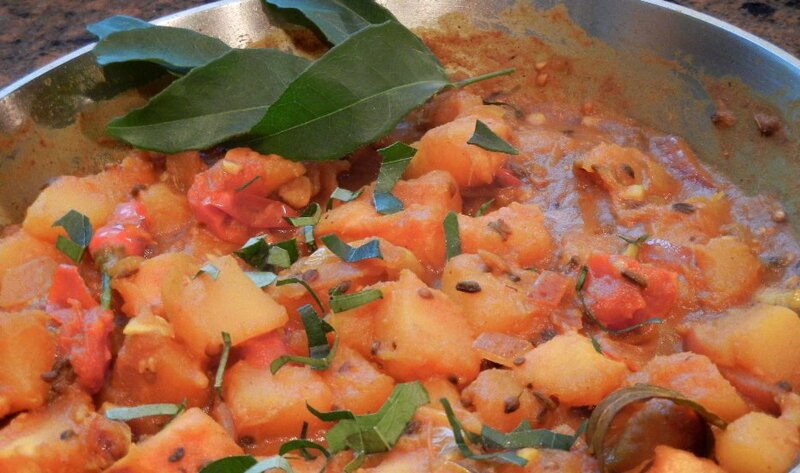 Tonight’s recipe is for a dal that adds root vegetables. Made with a base of quick cooking split red lentils, I added some onions, carrots, parsnips and potatoes. The pleasure of a dish like this is that if you manage the base technique, you can change up the ingredients, and even spices to make it just to your taste. Like cumin seeds, but don’t have the black cardamom? Fine. Use what you like and have. PK tip: The basic trick to getting the flavor right in this dish is heating the oil very hot and frying the whole spices until they are very brown. 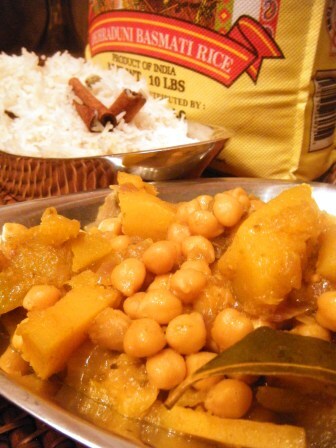 This makes a perfectly balanced vegetarian dinner if you serve this with basmati rice that’s been cooked with a cinnamon stick, four whole cloves and a few crushed cardamom pods. 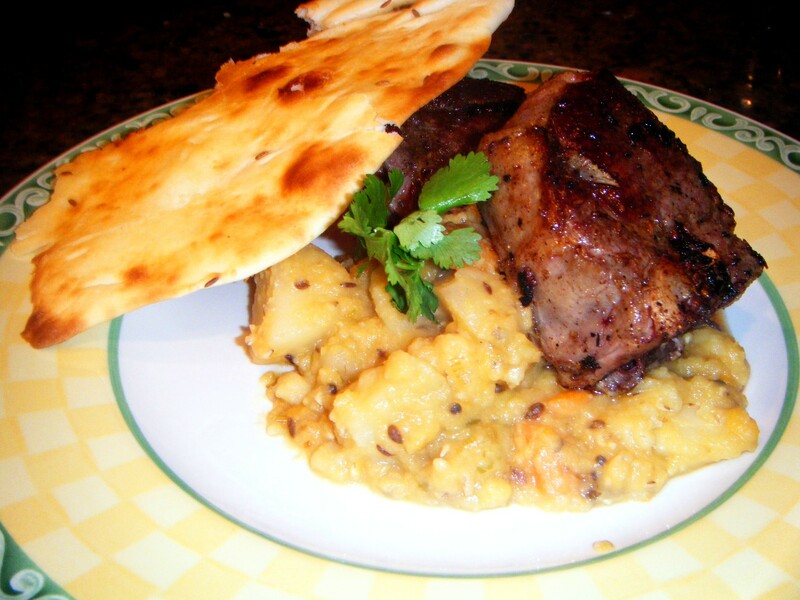 Or if you’re in the mood for meat, serve this, like I did, with garam masala dusted lamb loin chops and homemade naan bread with cumin seeds. 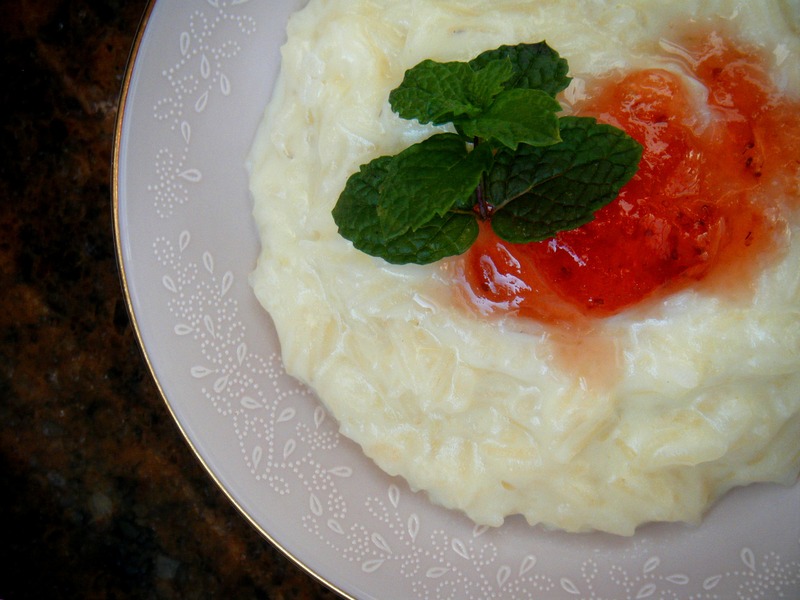 Rose-scented Basmati Rice Pudding | Ohh, Lah Lah! It’s a dessert! Readers with a sweet tooth, rejoice! I have yet to put one up on PK, although they’re made around here occasionally. This one is dead simple. Mostly because it starts with leftover Indian-spiced Basmati. If you’ve been around the Kitchen much, you’ll remember how much I love curries. For the pudding, I used the leftover rice that I had served with a delicate curry I made late last week. 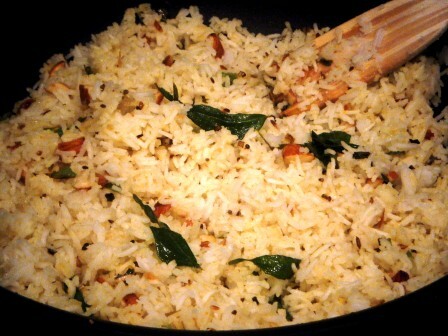 That lovely rice will go with lots of dishes and it smells heavenly. But really, you could probably use just about any plain-ish leftover rice. Just don’t go using Uncle Ben’s Mushroom Explosion or anything like that. This also gave me a chance to use the rest of my special Ohh, Lah Lah from the good folks at Snowville Creamery. Snowville is working on developing a new product (Ohh, Lah Lah) that is essentially 2% milk that’s been cold nano-filtered and reduced 2 1/2 times to make it thick and creamy. It’s low-fat, but you’d never know it, it’s almost like cream. It’s fabulous and not in stores yet so I squee’d when I got the chance to try it first. This turned into a perfect use for it. I ran out and need more already. I have so many other ideas. What do you say, Snowville? And for bonus points, this dessert takes ten minutes, start to finish. I love curries. Love, love, love. I love them even more now that I’m a bit more familiar with the cooking techniques and spices that are considered basic. Anjum Anand had an Indian Food Made Easy series on BBC that was really a great intro to the genre. You can find it on the Cooking Channel now, which to be honest isn’t really my cup of tea, save for series like hers. Tonight, I did a take on her Bengali Butternut Squash recipe, only with the last winter squash we picked up at Rennick’s a few weekends ago. It was a turban squash that I probably, in hindsight, should have roasted. Fortunately, Hades was the one that wielded the knife and not me. And score! no trip to the hospital. I really recommend this be done with a more manageable squash like a butternut or acorn. Really. Your local emergency room will thank you. Awww! Cherub is such a big help with chopping tomatoes. With a butter knife. Indian food is something I’ve developed a taste for. To the point that I crave it regularly. I didn’t always. I didn’t understand it; it was a little too exotic. Now? Let’s be honest here: I love it. It has become a point of pride that I’ve tried to learn what I can about a world cuisine that 1.1 billion (with a B) eat every day. On Sunday, Hades, Cherub and I made a stop at the Sawmill Patel Brothers, the Indian supermarket, and worked up the ingredients for a lovely English-inspired vegetarian curry (it’s the heavy cream that makes it smack of something that Richard Hammond might enjoy after a few shouts at his local). Cherub even helped pick out the 10 pound bag of Basmati rice that we ended up taking home. 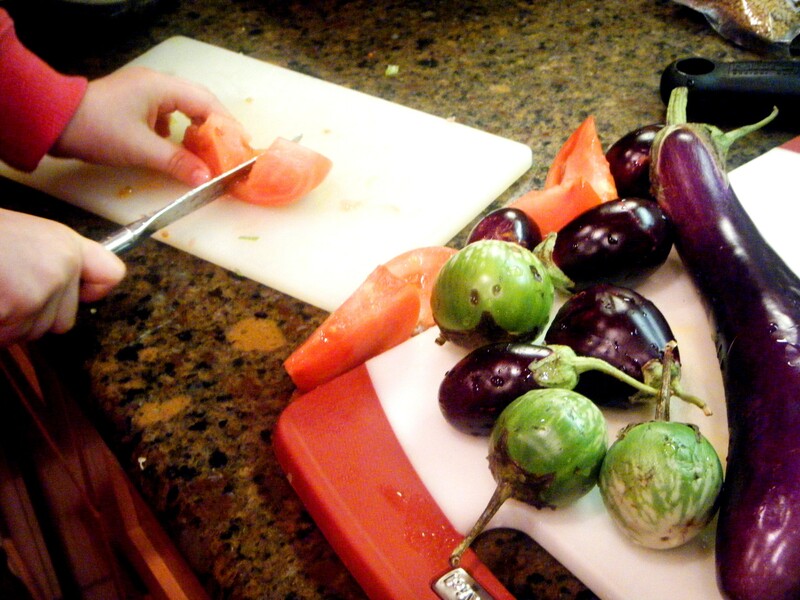 Add in some seasonal baby eggplants and cauliflower, plus the last (I keep saying this) of the tomatoes from our garden. Then a lovely melange of Indian spices from Patel to make it delicious. These two dishes require a bit of prep, but it’s totally worth the minor, and I do stress minor, effort. While you’re doing prep for the rest of dinner, soak the rice in cold water. When it’s time to get cooking, bring two cups of water to a boil and add in a generous sprinkling of salt. Then tip in the drained rice, bring back to a boil and then reduce to the lowest setting to simmer slowly for about 15 minutes. Turn off when done. You will finish this in a frying pan just before the curry is ready. 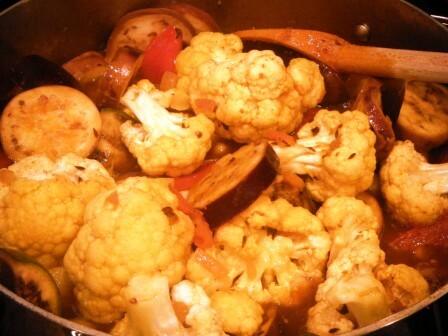 The cauliflower breaks down significantly in the 30 minutes it cooks. Leave it initially in large chunks, so that you'll have some variety in size when it comes time to serve the dish. In a pan heat a tablespoon or two of vegetable oil over medium high heat. Add in bay through mustard seed and cook for one to two minutes, until browned. Careful, the mustard seeds really pop. If you have a screen to put over the pan, by all means, do it. Then add in the onion and shallot. Continue to cook over medium high heat for another two minutes, or until just beginning to brown. Add in the garlic and the grated ginger. Cook for 30 seconds. Tip in eggplant through garam masala, cook for two minutes. Add in the water. Bring to a boil. Reduce heat to medium and cook for 30 minutes. Just before serving, reduce heat to low, add in the heavy cream and stir to incorporate. In a large frying pan, heat 1 to 2 T. vegetable oil over medium high heat. Add in the mustard, fenugreek and cumin seeds and the curry leaves. Cook for one to two minutes, until browned. Careful of the popping mustard seeds, cover with a lid or splatter screen. Add in the green onions and almonds, cook for two minutes. Mix the lemon zest, juice and fresh turmeric and pour in quickly and cook for 20 seconds. Add in the cooked rice and stir to incorporate the seasonings. Fry for two or three minutes to reheat. To serve, place generous servings of rice and curry in shallow plates, top with chopped coriander. Playlist included M.I.A’s Paper Planes.